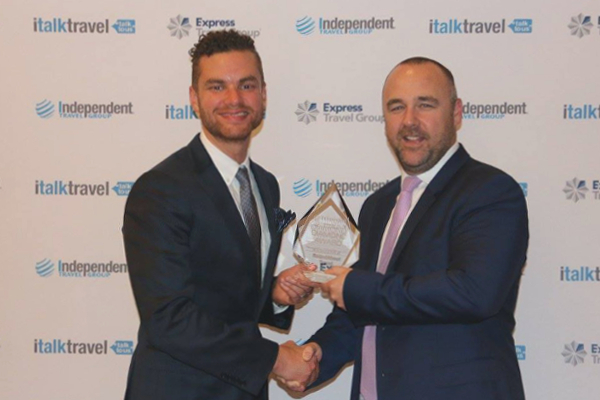 We are very excited to announce that QFlyer, as a part of the RoundAbout Travel group has been awarded 2017 National Travel Agent Of The Year at the Independent Travel Group national conference in Kuala Lumpur. RoundAbout Travel together with our subsidiary brands, QFlyer and Flat Beds, competed against 340 members nationally to take out the award. Launched in 2014, QFlyer is a part of the RoundAbout Travel group, started by Mark and Amy Trim in 2008. RoundAbout Travel is Australia’s only round the world specialist travel agency, selling over $120 million in round the world airfares over the past nine years, and launching subsidiary brands QFlyer and Flat Beds in 2014 and 2017 respectively after identifying the need for expert airfare specialists. QFlyer, provides airfare management for high tier oneworld frequent flyers with a view on maximising status credit earning opportunities. And business class specialist, Flat Beds, has a focus on providing best value international business class airfares on quality airlines. Together the brands continue to grow, with a team of 17 selling over $25 million in airfares this year alone and achieving a 9.8 trust score on TrustPilot to be the highest rated travel company on Trustpilot.com.au. RoundAbout Travel also picked up a Diamond Award in recognition of excellence at the event, one of only 3 agencies nationally to do so. QFlyer Director Mark Trim accepting the Diamond Award in recognition of excellence. Contact QFlyer to book your QFF airfares and maximise your status credit earn.